Background/aim Retinal degeneration is a leading cause of vision loss. Exposure to pesticides is a high risk factor of retinal degeneration. The aim of the work is to investigate the molecular structural changes of retina associated with the topical application of glyphosate (GLP), an organophosphorus compound pesticide. Materials and methods Twenty rabbits were randomly categorized into four groups. Group I served as control (n=5, 10 eye balls) and the other three groups (each composed of five rabbits) received topical instillation of 100 μl twice a day of GLP in three concentrations of 0.12, 0.97, and 7.8 mg/kg, respectively. After 1 week, eyes were enucleated and retinae were removed and prepared for analysis by infrared spectroscopy (Fourier-transform infrared spectroscopy). 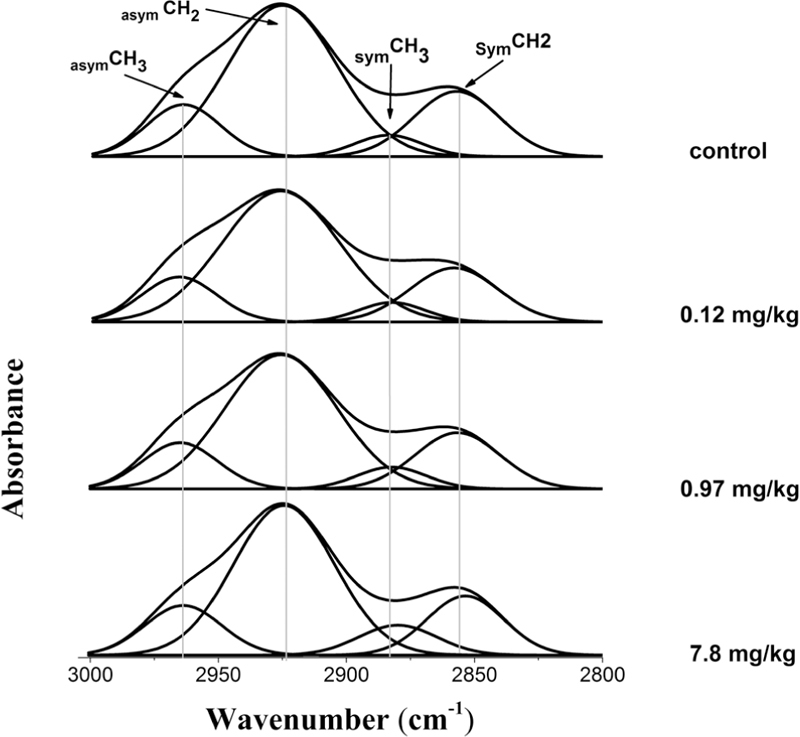 Results The regions of NH–OH spectra indicated a significant decrease (P<0.05) in wavenumber and restriction of two components related to strO–H and OHasym band after application of GLP. The protein secondary structure components in terms of β sheets, alpha helices and β turns were changed in groups III and IV. Also the fingerprint regions indicate changes in the surrounding environment after all doses of GLP. Conclusion Certain retinal structure modifications may lead to the degeneration of retina after topical exposure to GLP in rabbits. So this herbicide should be handled with caution. National governments must introduce a GLP reduction program because of its damage effect on retina function. Pesticides are important elements in agriculture and extensively used to control harmful pests and prevent crop yield losses or product damage. Owing to its high biological activity and long persistence in the environment, pesticides may cause undesirable effects to human health and to the environment . Pesticides enter the human body by four ways: ingestion, inhalation, by skin contact and through ocular exposure. Regular and occupational exposures in the agricultural sector include pesticide applicators, farmers, and other agricultural workers . Handling of pesticides and subsequent hand-to-eye contact increases the probability of ocular exposure in workers. This may also be caused by improper practices as the lack of washing hands. Aerial spraying of pesticides into the environment over farms also increases the risk of ocular exposure in workers on the ground. Ocular exposure to pesticides can occur in nonoccupational accidental circumstances in the general population . Glyphosate [N-(phosphonomethyl) glycine] (GLP) is an organophosphorus compound pesticide that is used as an active ingredient of many herbicides and plant growth regulators and found in more than 750 products of them . Glyophosphate was commercially introduced in 1974 since that its use increased rapidly. When it had been registered, it was classified as safe for vertebrates as these herbicides affect the shikimate pathway through the inhibition of specific enzymes responsible for aromatic amino acid metabolism and this pathway did not exist in animals, but the scientific researcher observed that these herbicides cause hepatic, renal, reproductive and neural toxicities . Treatment of albino mice with GLP induce hepatotoxicity, nephrotoxicity, lipid peroxidation, and genotoxicity from significant increase in serum aspartate aminotransaminase, alanine aminotransferase, blood urea nitrogen, creatinine levels, and malondialdehyde levels of the liver and kidney tissues . Histopathological examination has shown that there was degeneration in hepatic cells, neural cells, pancreatic acinar cells, stomach cells, and tubular necrosis of rats subchronically exposed to GLP . Hernández-Plata et al. have evaluated the effects of three intraperitoneal doses of GLP (59, 100, 150 mg/kg body weight) on the nervous system in male Sprague-Dawley rats for a period of 2 weeks. They reported decreases in locomotor activity, binding to D1 dopamine receptors in the nucleus accumbens, extracellular dopamine levels in the striatum, which mean that GLP affects the dopaminergic system. In a vivo study by Dai et al. in rats after administrating GLP at doses of 5, 50, 500 mg/kg once a day for 5 weeks, the results explained that GLP has low reproductive toxicity. In industrialized countries, retinal degeneration is a leading cause of decreased visual acuity and loss of central vision among older adults . Exposure to pesticides was considered recently as a major risk factor and may increase retinal degeneration ,,. This research aimed to demonstrate retinal structure modifications that may lead to retinal degeneration after topical exposure to GLP in rabbits. The chemicals utilized were obtained from Sigma Company (St. Louis, Missouri, USA) with the highest purity commercially available. Rabbits from both sexes (2–2.5 kg) were haphazardly chosen from the animal house facility at the Research Institute of Ophthalmology, Giza, Egypt. The protocol of the experiment was approved by the local ethics committee, The Association for Research in Vision and Ophthalmology. GLP was dissolved in deionized water in order to prepare the three concentrations, 0.12, 0.97, and 7.8 mg/kg, that will be applied topically to the animal’s eyes. These GLP solutions were freshly prepared each day. Twenty rabbits were randomly allocated into four groups, group I as the control (n=5, 10 eye balls) and the other three GLP-treated groups (each composed of five rabbits) that received topical instillation of 100 μl twice a day of the above-mentioned three concentrations. The experiment proceeds for 1 week. After decapitation of the animals, eyes were enucleated, and the removed retina was mixed with KBr powder to prepare a disk to be used in the analysis. The disk was placed in a metallic holder and pressed under vacuum at 3 tons for 2 min thus obtaining IR-KBr disks . Measurements were done using infrared spectrophotometer (ThermoFisher Scientific Inc., Waltham, Massachusetts, USA). The resolution was set at 2 cm−1 and dry N2 gas was used to remove interference. Correction of the baseline of the spectra was done and then smoothing to remove noise and finally Fourier transformation was used. Results were displayed as the mean±SD. To obtain a comparison between groups, investigation of fluctuation was done by using the commercially available software program (SPSS-11 for windows, SPSS Inc., Chicago, Illinois, USA), where the significance level was set at P<0.05. All the spectral were averaged using OriginPro9 program (Origin Lab Corporation, Northampton, Massachusetts, USA). The spectra results from Fourier-transform infrared spectroscopy to retinal tissue extracted from control rabbits and all groups received topically GPL cover in the range 4000–400 cm−1. 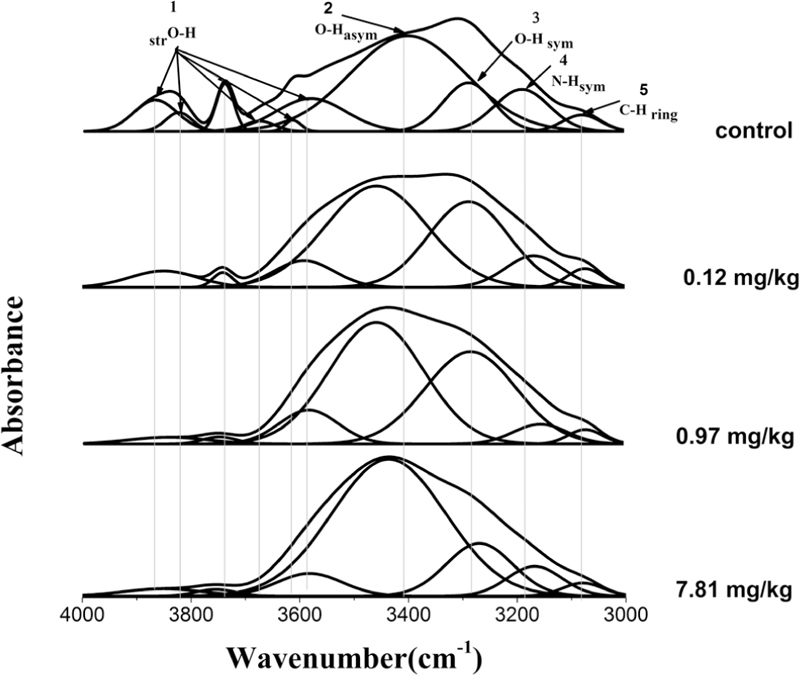 All the spectra were analyzed in three frequency regions, 4000–3000, 3000–2800, and 1600–900 cm−1, corresponding to NH–OH, C–H, and the fingerprint region, respectively. Amide I (1700–1600 cm−1) that is related to the fingerprint region was discussed separately due to its importance in protein secondary structure. [Figure 1] shows the spectral range 4000–3000 cm−1 related to stretching NH–OH function group to normal and the three doses topically received GLP (0.12, 0.97, and 7.8 mg/kg). The assignments of the different bands and the bandwidths for all groups compared with the normal are illustrated in [Table 1]. In the normal pattern, there were 10 bands that appeared after the deconvolution procedure. The sixth peaks appeared at 3871±1, 3828±1, 3742±2, 3678±4, 3615±2, and 3582±2 cm−1, respectively, and they were corresponding to (1) stretching O–H (strO–H). The peaks at 3402±4, 3289±4, 3189±2, and 3078±4 cm−1 were related to (2) O–H asymmetric (OHasym), (3) OH symmetric (OHsym), (4) N–H symmetric (NHsym), and (5) CHring, respectively. Figure 1 Spectral region (4000–3000 cm−1) related to NH–OH of control retina and all groups receiving topical glyphosate. Statistically significant decrease (P<0.05) in the absorbance of all bands related to different assignment function groups except O–Hsym and C–Hring, which had no significant changes compared with the control group. Restriction of two components related to strO–H and OHasym band. 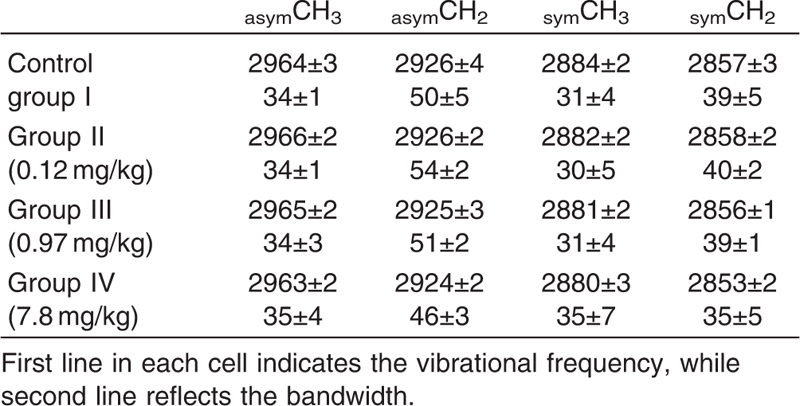 Statistically significant increase (P<0.05) in all bandwidths except in the bandwidth of CHring. After topical treatment with GLP to 0.97 and 7.8 mg/kg (groups III and IV), there were statistical fluctuation changes in absorbance and bandwidth of all function groups. In addition, disappearance of peaks related to strO–H and OHasym in both groups and another fraction of strO–H was vanished in group IV (7.8 mg/kg). [Figure 2] described the second analysis region (3000–2800 cm−1) due to C–H vibrations for all groups. The infrared absorption pattern of control group was characterized by four absorption bands at 2964±3 cm−1 with bandwidth 34±1 cm, 2926±4 cm−1 with bandwidth 50±5 cm, 2884±2 cm−1 with bandwidth 31±4 cm, and 2857±3 cm−1 with bandwidth 39±5 cm. These bands can be assigned to asymCH3, asymCH2, symCH3, and symCH2, respectively, as shown in [Table 2], which illustrates all groups receiving topically GLP compared with normal. After GLP application, there was no change on band position or on bandwidth in this region in comparison with normal value. Figure 2 The second analysis region (3000–2800 cm−1) due to C–H vibrations for control rabbits and the three groups receiving topical glyphosate. [Figure 3] illustrated the fingerprint region (1600–900 cm−1) that corresponds to the lipid and protein parts of the retinal tissues for all groups receiving GLP compared with control. After the curve enhancement procedure, the normal pattern showed the following bands: Three components at 1569±2, 1551±1, and 1524±3 corresponding to (1) amide II (N=Hbend); bands at frequencies 1458±1, 1396±1, 1309±1, 1236±2, 1166±1, and 1095±3 corresponding to (2) CH2 bend, (3) COO−, (4) CH3 def, (5) PO2−, (6) strCOOCasym, and (7) PO2−, respectively, and two components at 1057±3 and 968±1 corresponding to (viii) strCOC. The wavenumber changes for each band to all groups receiving GLP compared with normal and their bandwidths are illustrated in [Table 3]. For all doses of GLP, no effect was observed to amide II wavenumber or bandwidth to its three components. 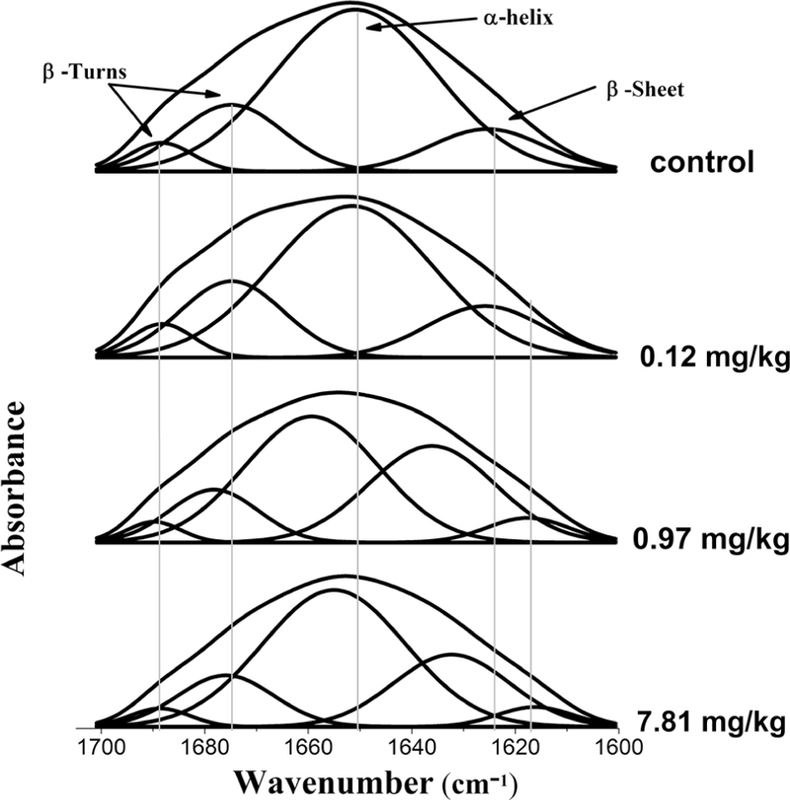 A statistically significant decrease (P<0.05) in the absorbance of CH2 bend was observed in group II and group III which is accompanied by splitting of the band in group IV. In contrast in COO−, a statistically significant increase (P<0.05) in its wavenumber was observed. CH3 def and strCOOCasym suffered an increase (P<0.05) in their width after all doses of GLP and fluctuating changes in wavenumber. A splitting in PO2− band was detected after 0.97 mg/kg of GLP (group III). A decrease (P<0.05) in wavenumber was observed in PO2− and a component of strCOC but in the same time an increase (P<0.05) in wavenumber was observed to the second component of strCOC after GLP. 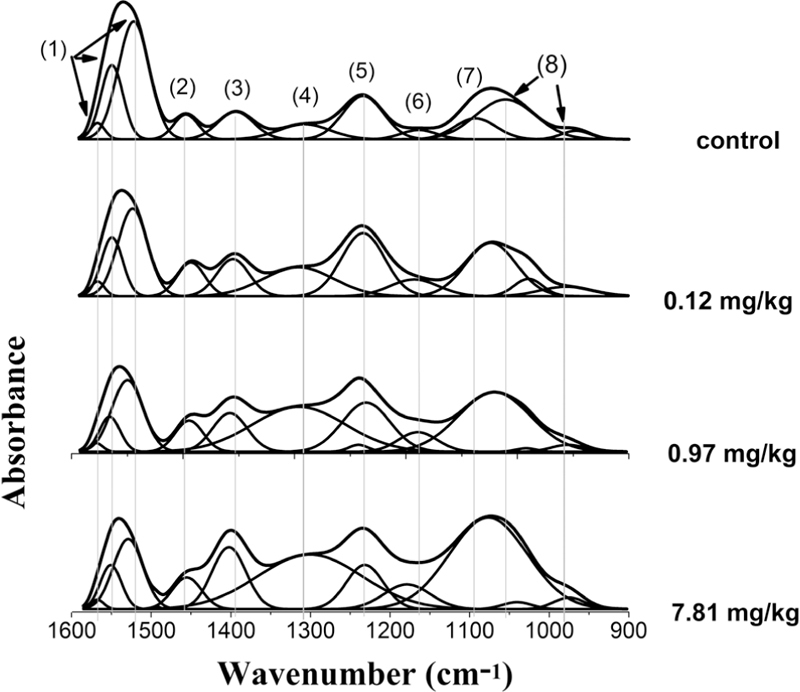 Figure 3 The fingerprint region (1600–900 cm−1) of the retinal tissues for all groups receiving glyphosate compared with control: (1) amide II (N=Hbend), (2) CH2 bend, (3) COO−, (4) CH3 def, (5) PO2−, (6) strCOOCasym, (7) PO2−, and (8) strCOC. [Figure 4] showed that the curve enhancement procedure resolved the contour of the normal amide I band into four compositional bands that were at 1688±3 and 1674±8 cm−1 (β-turns), 1650±7 cm−1 (α-helix), and 1625±22 cm−1 (β-sheet). In groups III and IV which are characterized by an increase of GLP dose, the protein secondary structure was characterized by the presence of a structural band discernible at 1636±10 and 1639±8 cm−1 which was assigned as the β-sheet structure. Figure 4 Amide I region (1700–1600 cm−1) for control and all groups receiving topical glyphosate. [Table 4] indicates that the distribution of normal protein secondary structure components that were calculated as the area percentage were 21.5±2.3% for β-turns, 66.5±3% for α-helix and 11.7±4%% for β-sheet. After 0.12 mg/kg of GLP (group II), there were no significant changes in the area percentage for protein structure components. In groups III and IV the relative distribution of the structural component differs. The β-turns and α-helix content significantly decreased (P<0.05). On the other hand, the content of β-sheet significantly increased. Organophosphorus pesticides poisoning is widely investigated, and a growing number of evidence indicates its effects to cause ocular lesions, but the mechanisms of its ocular effects are not well elucidated. In our study the effects of organophosphorus pesticide GLP on rat retina were investigated. Accidental splashes of pesticide exposure resulted in the direct entry of these chemicals into the eye tissue. As a result, these chemicals are absorbed through the eye tissue and enter the circulation, leading to systemic effects. Radioactive studies using β radiation had confirmed the transport of a carbamate insecticide from the cornea, through the aqueous humor and vitreous humor to the retina . A vibrational spectroscope technique − especially Fourier-transform infrared spectroscopy − can be used to probe the molecular structure changes that accompany diseased tissues. By assignment of functional groups, bonding and molecular conformations in spectral bands, accurate information about the biochemical and biophysical features of the oxidative stress damage in the retina can be detected. In the present study, the assignment of the C–H bands has been previously mentioned by Severcan et al. . CH stretching modes of retina did not change after all doses of GLP application. The peak assignments appeared in normal bands to NH–OH after deconvolutions were as previously mentioned by Dovbeshko et al. . The NH–OH region changes revealed unusual interface/binding mechanism that is related to different surrounding environment due to GLP application. O–H mode changes after GLP suggested different conformations. The band assignments of the fingerprint region had been indicated previously by Jung . The noticeable fluctuation changes in the fingerprint region recognized to an oxidative stress after topical application of GLP and increase the stress with the dose. The splitting in the PO2− band is a response to disorder in the lipid molecule and changes in the genetic material or phospholipids that involved in the structure of retinal tissues which is highly specialized layers. Amide I absorption is allied with protein amide C═O vibrations, and it is fitting to establish the special secondary structures of proteins and polypeptides. The types of secondary structure types include the α-helices and β-sheets that let the amides to hydrogen bond very powerfully with one another. In the α-helix the polypeptide backbone is coiled in a right-handed helix where the hydrogen bonding occurs between following turns of the helix. In β-sheets, the strands of the polypeptide are expanded and be positioned either parallel or antiparallel. Also, secondary structures include β-turns which are sharp turns that connect the neighboring strands in an antiparallel β-sheet . After topical application of 0.12 mg/kg of GLP, the protein secondary structure has not been affected. But there was a change in the α-helix, β-sheet, and β-turn contents to the other two doses of GLP. As the β-sheet content increased, the protein insolubility increased . β-sheet formation increases the disordered structure of the helical structure, and then the disordered chains aggregate to form β-sheet structure. So the two doses 0.97 and 7.8 mg/kg of GLP had supported the aggregation of proteins as they became more folded and insoluble. The mechanism of GLP damage to retina may be due to its action on dopamine as GLP decreases the extracellular level of dopamine. GLP may affect dopamine synthesis and interfere with the phosphorylation of tyrosine hydroxylase for the preservation of catecholamine levels resulting in a decrease in high-potassium-induced dopamine release . Dopamine is released by amacrine cells and activates D1 and D2 dopamine receptors dispersed throughout the retina. Dopamine also has various trophic roles in retinal function related to circadian rhythmicity, cell survival, and eye development. Any decrease in retinal dopamine results in reduced visual contrast sensitivity and affects the function of the retina . Moreover, another reason explaining the mechanism of GLP damage is the oxidative stress due to its action on reduced glutathione and lipid peroxidation levels of animals as an index of antioxidant status and oxidative stress . GLP causes damage to the retinal tissue on the basis of molecular structure. So this herbicide should be handled with caution. National governments must introduce a GLP reduction program due to its damage effect on retina function. All food processors should minimize their customer’s exposure to GLP residues by specifying GLP-free products from their suppliers. They should extend their internal pesticide monitoring program and include GLP in their regular testing. Christos AD, Spyridon DK. Farmers’ exposure to pesticides: toxicity types and ways of prevention. Toxics 2016; 4:1. Jaga K, Dharmani C. Sources of exposure to and public health implications of organophosphate exposure. Rev Panam Salud Publica 2003; 14:171–185. Jaga K, Dharmani C. Ocular toxicity from pesticide exposure: a recent review. Environ Health Prev Med 2006; 11:102–107. Guyton KZ, Loomis D, Grosse Y, El Ghissassi F, Benbrahim-Talaa L, Guha N et al. Carcinogenicity of tetrachlorvinphos, parathion, malathion, diazinon, and glyphosate. Lancet Oncol 2015; 16:490–491. Mesnage R, Defarge N, Spiroux de Vendômois J, Séralini GE. Potential toxic effects of glyphosate and its commercial formulations below regulatory limits. Food Chem Toxicol 2015; 84:133–153. Cavuşoğlu K, Yapar K, Oruç E, Yalçın E. Protective effect of Ginkgo biloba L. leaf extract against glyphosate toxicity in Swiss albino mice. J Med Food 2011; 14:1263–1272. Tizhe EV, Ibrahim ND-G, Fatihu MY, Onyebuchi II, George BDJ, Ambali SF, Shallangwa JM. Influence of zinc supplementation on histopathological changes in the stomach, liver, kidney, brain, pancreas and spleen during subchronic exposure of Wistar rats to glyphosate. Comp Clin Pathol 2014; 23:1535–1543. Hernández-Plata I, Giordano M, Díaz-Muñoz M, Rodríguez VM. The herbicide glyphosate causes behavioral changes and alterations in dopaminergic markers in male Sprague-Dawley rat. Neurotoxicology 2015; 46:79–91. Dai P, Hu P, Tang J, Li Y, Li C. Effect of glyphosate on reproductive organs in male rat. Acta Histochem 2016; 118:519–526. Kirrane EF, Hoppin JA, Kamel F, Umbach DM, Boyes WK, Deroos AJ et al. Retinal degeneration and other eye disorders in wives of farmer pesticide applicators enrolled in the agricultural health study. Am J Epidemiol 2005; 161:1020–1029. Modgil S, Lahiri DK, Sharma VL, Anand A. Role of early life exposure and environment on neurodegeneration: implications on brain disorders. Transl Neurodegener 2014; 3:9. Gomathy N, Sumantran VN, Shabna A, Sulochana KN. Tolerance of ARPE 19 cells to organophosphorus pesticide chlorpyrifos is limited to concentration and time of exposure. Pestic Biochem Physiol 2015; 117:24–30. Pham H, Lingao MD, Ganesh A, Capasso JE, Keep R, Sadagopan KA, Levin AV. Organophosphate retinopathy. Oman J Ophthalmol 2016; 9:49–51. Sherif SM. The impact of elevated blood glycemic level of patients with type 2 diabetes mellitus on the erythrocyte membrane: FTIR study. Cell Biochem Biophys 2010; 58:45–51. Budai P, Vamagy L, Somlyay IM, Linczmayer K, Pongraz A. Irritative effects of some pesticides and a technical component on tissue structure of the chorioallantoic membrane. Commun Agric Appl Biol Sci 2004; 69:807–809. Severcan F, Toyran N, Kaptan N, Turan B. Fourier transform infrared study of the effect of diabetes on rat liver and heart tissues in the C-H region. Talanta 2000; 53:55–59. Dovbeshko GI, Gridina NY, Kruglova EB, Pashchuk OP. FTIR spectroscopy studies of nucleic acid damage. Talanta 2000; 53:233–246. Jung C. Review Insight into protein structure and protein-ligand recognition by Fourier transform infrared spectroscopy. J Mol Recognit 2000; 13:325–351. Lin Shan-Yang, Li Mei-Jane, Liang Run-Chu, Lee Shui-Mei. Nondestructive analysis of the conformational changes in human lens lipid and protein structures of the immature cataracts associated with glaucoma. Spectrochim Acta A Mol Biomol Spectrosc 1998; 54:1509-1517. Mahmoud SS, El-Sakhawy E, Abdel-Fatah ES, Kelany AM, Rizk RM. Effects of acute low doses of gamma-radiation on erythrocytes membrane. Radiat Environ Biophys 2011; 50:189–198. Witkovsky P. Dopamine and retinal function. Doc Ophthalmol 2004; 108:17–40. El-Shenawy NS. Oxidative stress responses of rats exposed to Roundup and its active ingredient glyphosate. Environ Toxicol Pharmacol 2009; 28:379–385.